The action comes alive with original artwork by DC Comics illustrators – these full colour chapter books will captivate young readers. 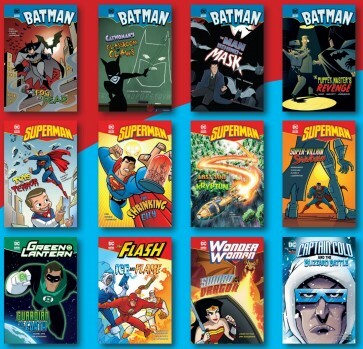 Thrilling adventures featuring favourite Super Heroes and Villains from the DC Universe. Batman, Superman, Green Lantern, The Flash and Wonder Woman do battle with arch villains including The Joker, Catwoman, Lex Luthor in this collection of fully illustrated chapter books. The action comes alive with original artwork by DC Comics illustrators – these full colour chapter books will captivate young readers. All books arrive labelled with Quiz Number, Interest level, Reading Level, and AR Points.